No, you’re not looking down at the Amazon or the Nile (although the confusion would be understandable)… this is actually a river on an entirely different world: Saturn’s moon Titan! 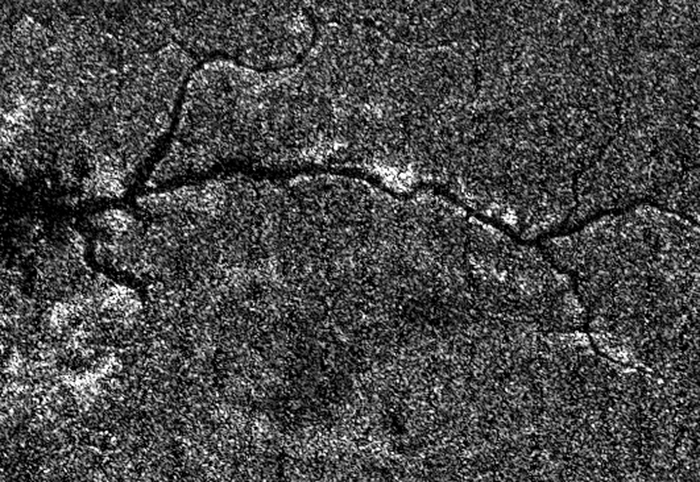 Radar imaging by NASA’s Cassini spacecraft has revealed what appears to be a long river system, complete with side-branching tributaries, meandering across the surface of Titan. Of course on frigid Titan the river wouldn’t be flowing with water but rather liquid methane and ethane — quite literally a river of natural gas. Water on Titan’s surface stays frozen harder than rock and what’s a gas here on Earth is cold enough to be a thick, viscous liquid there, 880 million miles from the Sun. This image from NASA’s Cassini spacecraft shows a vast river system on Saturn’s moon Titan. It is the first time images from space have revealed a river system so vast and in such high resolution anywhere other than Earth. The image was acquired on Sept. 26, 2012, on Cassini’s 87th close flyby of Titan. The river valley crosses Titan’s north polar region and runs into Ligeia Mare, one of the three great seas in the high northern latitudes of Saturn’s moon Titan. It stretches more than 200 miles (400 kilometers). Scientists deduce that the river is filled with liquid because it appears dark along its entire extent in the high-resolution radar image, indicating a smooth surface. That liquid is presumably ethane mixed with methane, the former having been positively identified in 2008 by Cassini’s visual and infrared mapping spectrometer at the lake known as Ontario Lacus in Titan’s southern hemisphere. Though there are some short, local meanders, the relative straightness of the river valley suggests it follows the trace of at least one fault, similar to other large rivers running into the southern margin of Ligeia Mare. Such faults may lead to the opening of basins and perhaps to the formation of the giant seas themselves. What a wonderful world that Titan 😉 and nevertheless if different ! !